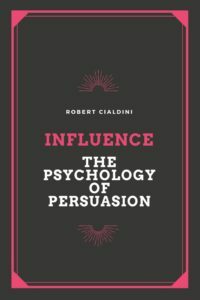 Influence The Psychology of Persuasion is a book by Robert Cialdini which tells us about various ways in which our brain gets influenced by various situations. The book even tells us about the reasons because of which our brain reacts in a specific manner in specific situations. This book is recommended to every marketer to get success in his career. Here, I’m sharing the six principles given in the book. You can also download the PDF and other versions of the ebook from the end of this post. When a person with high authority, like your boss, orders you to do something, you end up doing it even when you are not willing to do it. If we assign a numeric value to this statement then it can be said that 65% people would go to extreme levels (like shocking an innocent with 450 volts electric current) just to follow the orders. It is inferred from the Milgram Experiment which was conducted to discover whether it is possible that people involved in Holocaust were just following their orders. Authority Principle can be seen working in the medical field too. It is said that when a doctor of higher rank makes an error, rarely his lower level colleagues point out and correct his mistake. The funny case of the “a rectal earache” can be seen to understand how strong this principle works in the medical field. The influence of authority is on us because of our upbringing. In every culture, elders are respected and followed. From our childhood, we are told to follow our elders in every situation as a gesture of respect. Our religion also tells us the same. As we all know, we all have an effort minimizing brains, following elders just help us in minimizing the efforts of thinking. We presume that since our elders have more experience in life, all the thinking exercise has been done by them for different situations of life and therefore we just need to follow what they say and do not need to think. Since the concept of following our elders is based on the assumption that they possess the knowledge, therefore following anybody who possesses knowledge makes sense to us. This is the reason why professionals like doctors, lawyers, teachers etc are followed without questions because they are supposed to have knowledge of their respective fields. It is not necessary that only a person with real authority can influence us. As I have personally experienced, when I am dressed in a blazer, a formal shirt, and a trouser, strangers address me as ‘Sir’. On the other hand, while wearing a T-shirt and a pair of jeans, they approach me like just another guy. I mostly come across strangers when they are asking for the route to the place they want to go. It is worthy to note that if you have a high professional title (Prof., Dr., etc) or if your clothing is like a person with a high profession or your belongings indicate you are a professional, then you are all set to be perceived as a person with authority. How marketers use this principle? You must have watched the TV ads in which actors dressed like doctors suggest you use a specific toothpaste or a soap. Why do they do so? Because marketers know that you will listen to the experts! We value things more when there is a scarcity of them. We pay more attention when we are told, for example, “You can lose 5 bucks by doing this!”. We do not pay the same amount of attention when we are told, “You can gain 5 bucks by doing this”. The scarcity of 5 bucks appeals us more than the gain of 5 bucks. This is how the Scarcity Principle works on our mind. This principle makes things costly which have high demand and low supply in the market. Similarly, rare antique items become more valuable because of this principle. Marketers take advantage of this principle by advertising the product they are selling as limited in stock. We pay more attention to such advertisements because we think if we are not buying the product right now then we will lose them because we will not be getting the chance to buy them in the future due to its scarcity. The ‘limited time deals’ work the same way by giving us a short deadline to buy a product. The scarcity principle works because of the human nature of loving freedom and hating restrictions. This tendency starts to sprout in children at an early age of two, more popularly known as The Terrible Twos. At this stage, a child does exactly opposite of what is being asked him to do. By opposing his parents he enjoys the freedom of doing whatever he wishes and escapes from the captive feeling of being in control of his parents. Similarly, the limited period offers made by marketers to us, make us feel that we are restricted and we do not have the freedom to buy their products later, so we cope with such violation of our freedom by buying the product right then. How teenagers react when their choices are made limited can be understood by observing teen couples. When couples in teenage face parental interference in their love life, their love for each other becomes even stronger. They fight against the scarcity of choices being imposed by their parents to prove their freedom. Although fictitious, Romeo and Juliet are a perfect example of rebellious teenage love. At every age, humans have the tendency to seek what is scarce and then justify why they are seeking them. Consider this case of soap smuggling example for instance, where people started smuggling a specific type detergents when the government banned it in their area. People also came with different justifications to prove their beliefs to be genuine. Another important aspect of the scarcity principle is that its effect is stronger when scarcity of freedom is followed by the time when there was an abundance of freedom. This concept can be understood by James Davies’ Theory of Revolutions. It says revolts are more likely to occur in a country where freedom is taken back from the people. The countries in which no freedom is ever given to its people do not pose much threat of revolts. In a nutshell- People want to do what they cannot do. They hate the restrictions which scarcity brings to them. Marketers use this tendency for their profit by making people do what marketers want them to do. So always remember this theory of Scarcity before buying from a limited period offer. When someone does a favor to you, you feel indebted and try to repay the complete debt as soon as possible. The principle of reciprocation is pervasive. It is found in each and every society of the world. When our friends present us gifts on our birthday, we try to gift something equally valued to them on their birthdays. We are taught to reciprocate from our childhood. We despise people who do not follow this unwritten law. Many experiments have been conducted to prove this principle. Below are some of them. In the year 1976, sociologists Phillip Kunz and Michael Woolcott sent more than 500 Christmas cards to complete strangers. In every card, they clearly wrote the sender’s address. As a result of the experiment, around 20% of the people responded back to the sociologists with greeting cards. When 20% of the people reciprocate to complete strangers, imagine what would be the response rate among people who know each other? Two subjects get a short break in an experiment of rating paintings. In reality, one of the two subjects was the assistant of the experimenter. During the short break, in one case the assistant goes out for a while and brings a Coca-Cola for the subject. In another case, the assistant returns empty-handed. In both the cases, after the rating procedure was complete, the assistant tries to sell some raffle tickets to the subject. The success rate of selling the tickets was twice in the case in which the assistant did the favor of bringing coca-cola to the subject. The subject gets influenced by the favor and reciprocated by buying the tickets. Why does the principle work? The roots of this principle are also derived from our evolution. We have evolved by sharing our resources and skills. Reciprocation has motivated mankind to share resources without the fear of losing them. It made us confident that if we will give something to someone then we will get something in return. By sharing resources with the needy, we increased the chances of survival of each other. The practice of distributing free samples is completely based on the principle of reciprocation. When a marketer offers us to taste free samples of five different products, then rejecting all of them and walking away empty-handed feels odd to us. We end up purchasing at least one item. Amway has built all of its business by distributing free samples, by successfully using people’s tendency to reciprocate. Bargaining also works on the principle of reciprocation. When a seller of a good asks for a high price then we decline the offer, He then reduces the asking price slightly. We consider the new offer as a favor done to us by the seller. We reciprocate the favor with a small increment in our proposed price. Ultimately we reach a point in which both parties agree to transact. Therefore while selling, we should propose a price which is slightly higher than the price we want for our product. We determine what is correct by finding out what other people think is correct. You take decisions after carefully observing others. In the state of confusion on whether to do or not to do something, you are most likely check whether others are doing the same or not. If everyone is doing it, then it must be right for you. Fake Laugh Tracks- People laugh at silly jokes in sitcoms after hearing the fake recorded laugh track. Imagine the same joke being cracked without that fake laugh track in the background. Would you now laugh at that joke now? Accidents- I have seen people falling off their bikes and nobody stopping by to see if the person is alright or not. Everyone who thinks of stopping by first checks with the other people and then decide whether to help the person or not. How Marketers use Social Proof? While browsing within a product category on Amazon, you will definitely come across the bestseller product of that category. Do you know why Amazon and other e-commerce do so? So that if you are planning to purchase something in that category, then seeing everyone buying that product will make you sure that you should buy that product too. Once we have made a choice or taken a stand, we will encounter personal and interpersonal pressure to behave consistently with that commitment. After placing a bet on a team, you become more confident about the victory of that team. After purchasing a phone, we start telling how our phone is better than other phones. Our present actions are based on our previous actions. We do what is consistent with our past behavior. It doesn’t matter whether we are going in the right direction or in the wrong direction, what matters is that whether we are going in the same direction or not. Why do we show Commitment and Consistency? We subconsciously want ourselves to be seen as a man/woman of words. A person who believes one thing in the morning and another thing by evening is generally seen as a weak person who is not even able to take his own decisions. Being viewed as a confused person is not something you would appreciate, therefore you stay stuck with your decision. Additionally, commitment and consistency also save you from the uncomfortable feeling of indecisiveness. it’s rare to see a nice blog lie this one today. If you have read so far then you deserve to receive two book summaries every month in your mailbox.